These favours are a favour that is suitable for both the women and men in your wedding party. These beautifully wrapped favours contain five insence sticks that are available in a choice of fragrances. They are wraped and embellished to match your theme and colours. 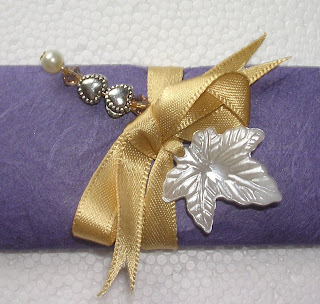 The inner wrapper containing the sticks is designed with your names, date of your wedding and a greeting. The favours make a beautiful accessory to the table or can be placed in a basket to be handed out personally to the guests.